Parents always want the best for their children. By using eco-friendly products for your babies it is a win-win situation; you are protecting our planet as well as protecting your little one from awful chemicals & toxins. The following are the top five eco-friendly products for your Green baby. 1- Organic Baby Food – Give your baby the most natural food out there with either homemade baby food or store bought organic baby food. 2- BPA Free Pacifiers, Bottles, Teethers – Keep nasty chemicals away from your baby by using plastic items that are BPA free. 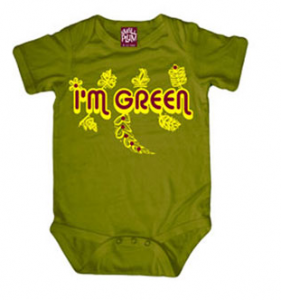 3- Bamboo or Soy Onesies – Protect your little ones delicate skin with soft soy or bamboo clothing. 4- Eco-Firendly Diapers – Save our landfills by using eco-friendly diapers; either cloth, biodegradable, or flushable. 5- Sustainable Wood Furniture – Preserve our forests by buying cribs, rocking chairs, and other furniture from sustainable wood. This list cannot be anymore right. A lot of eco friendly sites sell these products at better prices than retail stores. I found some eco baby products at ecodirectstore.com and almost ALL of the prices are discounted. It makes being eco friendly much more accessible..and you don’t have to leave the house!! Great post, I’ve just had a baby girl myself. Something that can also help in an attempt Bliss Baby diaper rash cream is a blend of natural ingredients including zinc and she a butter to protect your baby’s sensitive skin irritation and soothe the skin. A food, is the application of diaper cream without using petroleum products or parabens.